rocky's bru: Tenaga Nasional did not get to "bail out" 1MDB! Sob! Tenaga Nasional did not get to "bail out" 1MDB! Sob! On Facebook yesterday, I was asked to comment on the award of Edra to China General Nuclear Corporation, a global giant, for USD2.3 billion. "I'd have preferred that Edra had gone Tenaga's way as I'd written h e r e last week. 1. CGN is paying some RM2 billion more (than what YB Rafizi Ramli said 1MDB should be getting for Edra, here), money much needed by 1MDB for its rationalisation program. 3. Tenaga does not need to increase its borrowings to buy Edra after all. It means it can focus on existing operations and investments. (Tenaga is also managing a few assets abroad). 4. Edra is about power "generation". Tenaga still controls "transmission" and "distribution", the two more critical components of the business. Even without Edra,,Tenaga still controls half of the domestic power generation. Whoever generate power does not get to determine tariffs, unless it's a monopoly. 5. Lastly, CGN is a large foreign investor. Foreign investors before CGN came in not just with money, they created jobs and competition, transferred technology and generated important spin offs." Marahkan nyamuk (Edra) kelambu (Tnb) di bakar...lar ni nyamuk dah tak dak lagi (dah pi Cina)...kelambu dah tak dak guna kot...eloklah Rapizi simpan Tnb masuk lokar jer. TNB did not get the Edra. All these happened partly because of the over protective stands taken by The Smart Alecks. I know you are trying hard to defend the Government, but unfortunately you are missing the point altogether. IPP was said to be the hallmark of the wrongs of Mahathir’s era. Ani Arope’s criticism towards the decision was used many times to justify the sentiment. Tenaga has always been anointed as the right single party to power generation, transmission, and distribution business in this country. And it is rightly so as power industry should be classified as a strategic security business in the first place. For that, I concurred that Mahathir has made a wrong decision on IPP. Yet, instead of waiting for the 1st generation of IPPs’ agreements to end and let them die of natural course, Najib decided to extend their existence. To make it worst, instead of buying the rights and pass it over to Tenaga, Najib decided to sell the whole lot to a foreign entity. So instead of righting the wrong, Najib just made it worst. THAT IS THE ONE WE SHOULD BE CRYING OVER. SOB!!!! What kind of business model practiced by 1MDB? You created debts. You paid fat commissions and interests to the bankers. So this is the success story of 1MDB. Sell their assets to the foreigners so that they can pay their creditors. So might as well 1MDb was not created in the first place so that no creditor and no need to sell our assets to foreigners. so you don't mind our "energy" is being control by an outsider ? and you call your self "patriotic" or more to pathetic ? what is the reason to let go the power plants in the first place? Why the need to sell those plants? It is because the lousy 1MDB doing. 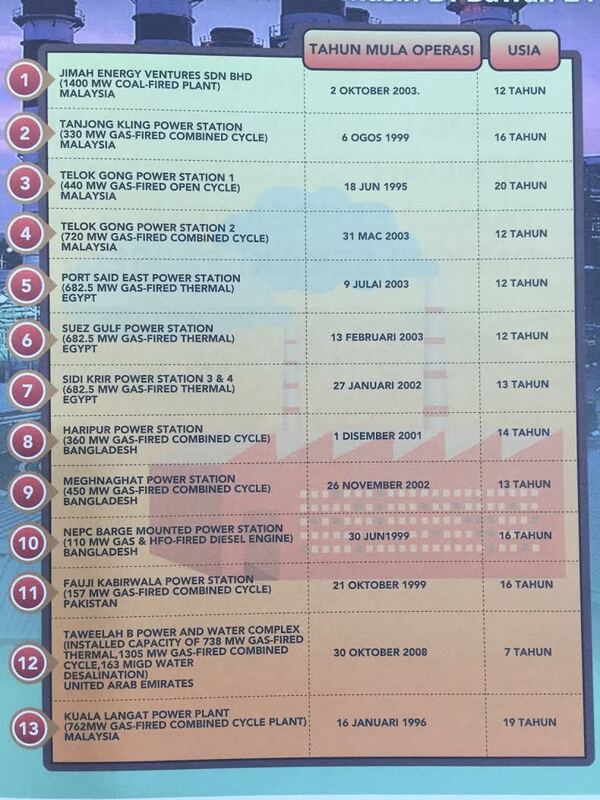 and infact the existence of 1MDB is the root of all problems, atleast in the selling of the power plants. Both options available for decision in term of this power plant thing, are WRONG OPTIONS. wrong for tenaga to buy (bail out). wrong for foreign buyer to buy (national security risk and policy breaking). but for 1mdb, we need to execute wrong option and make wrong decision. you know why we need to do wrong decision? because 1mdb need money so that rationalisation plan can be execute. why 1mdb need rationalisation plan in the first place? it is because the business model is wrong and get all of us in debt. all these wrong decision and yet umno people were clapping hands for arul kanda. gone long are the days malaysia is a proud nation. Buy LOW, sell very-very HIGH. Buy at RM18, sell at RM 9.83 Billion. Same with that prime-land which was destined for Bumi's business center: 1MDB buy low, sell high. What a brilliant business model. Is this what they called 'Rasionalisation' Plan? Maybe, in future the gomen them back at RM 18 Billion. By that time its already turned into an aging Nuclear Power Plant. No wonder Goh Chock Tong became very rich after the gomen gave him the mountain-top. How many bottles of brandy you consume. You post sounds more of a sour grape rocky.. State-owned strategic investor 1Malaysia Development Bhd (1MDB) defended its purchase of power assets from Genting Group, saying the acquisition was made for their long-term value and not out of political considerations. "As we have previously stated, we only acquire assets when we are convinced that they represent long-term value, and to suggest that any of our acquisitions were driven by political considerations is simply false," the state investment vehicle said. "1MDB takes a long-term view of value when entering into transactions; not just for the company, but for the country, as befits our 100% ultimate ownership by the government of Malaysia." there goes the 'long term vision'. itu belum lagi kira the cost incurred by 1mdb for their forays in the energy sectors costing more than rm18b in total. now they are selling it at a discount to the china power giant..
sorry, there is a typo error on the total amount paid by 1mdb for their forays into the energy sector. It cost them rm12b and now they are selling it at RM10b.. a loss of rm2b.. So, why claim that Malaysia is "open for business"? 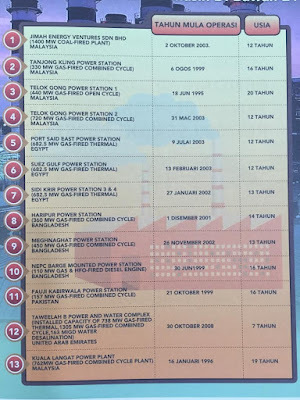 Malaysia's YTL Power owns one of the 3 power producers in Singapore. Chinese interests control another power producer in the city state. So, isn't rational and pragmatic Singapore worried about "energy security"? Or does it trust that a strong and independent regulator will be able to keep tabs on the industry? Hopefully 1MDB can move forward and would like to commmend the PM and En Arul for their effort and most importantly for keeping their promises that the problems would be settled within 6 months. Finally lets open Malaysia market, how about the telcos? Why don't the government let in the Singapore company who wants to sell to consumer cheap 100mb speed to home. We done with power why not extend to communication. Bring in some competition to our country. I really don't understand your reader fear of foreigner owning Malaysia asset. They can just pack the asset and take it back to their ow. Country. It is not that we ipp can dictate the rates to consumer. The government of Malaysia has the final say in rate. The only fear these so call pro Nasionalist have is that how the foreigner company will show how inefficient the local ipp are. Time to compete with the rest the world on your home ground. So Saudi Arabia, Qatar and Abu Dhabi didn't want to get involved in this deal? So much for solidarity! Or maybe they realised that it's futile to compete when China opens it's purse? It's noteworthy how China is on a "charm offensive" these days. China Construction Bank plans to issue and list 1 billion Yuan Land & Maritime Silk Road bonds on Bursa Malaysia. This comes after China said it will buy more Malaysian government bonds and grant Malaysia a 50 billion Yuan quota to invest in Chinese stocks and bonds under the RQFII plan. Bro , did you mentioned that CGN acquired all the associated debt also ... ? A cool USD 2.3 B in the bank . 100% equity of a government concession to a foreign own company? bravo najib, you are the best! you just do the unthinkable stupid thing ever. after this our country can no longer protect our own interest. Oh ya...you want to sign TPPA too...no wonder. And please remind pekasa and Ali tinju n Jamal ikan bakar that they come not at the invitation of Malaysian Chinese, ok? The government is the one who invites and welcomes them ...is kampong keramat safe ? Why are there so many negative thinkers. Jual salah tak jual pun jadi salah. Inilah penyelesaian yang paling elok. I think you all are on on the same level as RBA. Whatever Najib does is not right. Why are all of you like this. Astaghfirullah. Well, kerja dorang asyik bangkang aja...walaupun benda betul pun, main bangkang aja...Apa nk buat, dah takda akal..